On Sunday, March 23, 2014 we hosted our first Maple Flapjack Brunch, a fundraiser for the Cleveland Firefighters. Guests came to the Heritage Barn on our farm to enjoy homemade pancakes, maple sausage links, milk, hot apple cider, coffee and pure maple syrup made on the homestead! Many guests took a walk down to the sugar shack to see the maple syrup make process and try fresh hot maple syrup! As this was our first time hosting a maple flapjack brunch, we expected about 300 people. We were pleasantly surprised when the final numbers came in after all was said and done: We hosted about 600 people and served brunch to 473. 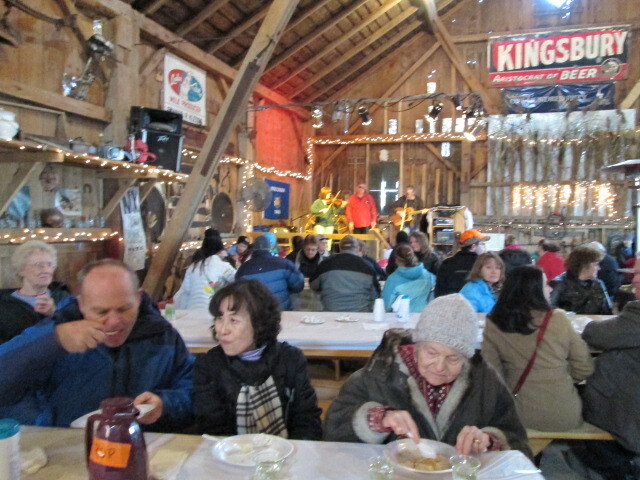 Our guests ate 1090 flapjacks, 1440 maple links, 4.5 gallons of maple syrup, and 14 gallons of apple cider. We are excited to be better prepared next year! Check out our detailed flyer for more information about the event. This entry was posted in Events, Fundraisers, Uncategorized. Bookmark the permalink.